It took us a long time to come around to Dominion. We were looking for a 2 player game, and it kept coming up. So we would go to the game store and pick it up, and think –this is just a box of cards. It’s a Big box of cards, sure, but we were looking for a board game, not a card game. But we’d browse BGG and see how highly Dominion was thought of, and see the Spiel de Jahre prize it had, and go back and look at it. And though it had been a long, long time, a youth spent playing Magic: The Gathering still left me dubious of card games. What finally convinced us was this great review, which made the game seem compelling and fun. Which it is. It is part game, part puzzle, and the very definition of more-ish. Finishing a game of Dominion always makes me want to leap back in and try again, particularly if I lose. Because next time I will surely consruct a deck that is leaner, better, faster, or just completely different, allowing me to feel out a change of tactics. You always feel like you are reaching for that elusive perfect combination of cards in the right proportions. Of course, there are sites that lay all this out, instructing on the right combinations and tactics –but Dominion is a deck building game. If I go and read how to build my deck, where’s the game? That was of course the problem with Magic (similar with any CCG I imagine). It became about spending more to construct that perfect deck, buying booster after booster. Dominion is, for me, the perfect antidote to this. The game isn’t about playing with the deck you’ve constructed –the game IS constructing that deck. And you do it with the exact same resources that your opponent does, and with no hidden information. Reading that last sentence back, it seems like that should steal some of the fun. But it doesn’t. The game is so perfectly constructed, so competitive, challenging and downright fun that it’s almost alchemic. And yes, we bought sleeves. It was the shuffling that did it. There is so much shuffling, and it can slow down an otherwise very zippy game. Sleeved cards shuffle so much easier and quicker I couldn’t really conceive of playing Dominion without them. 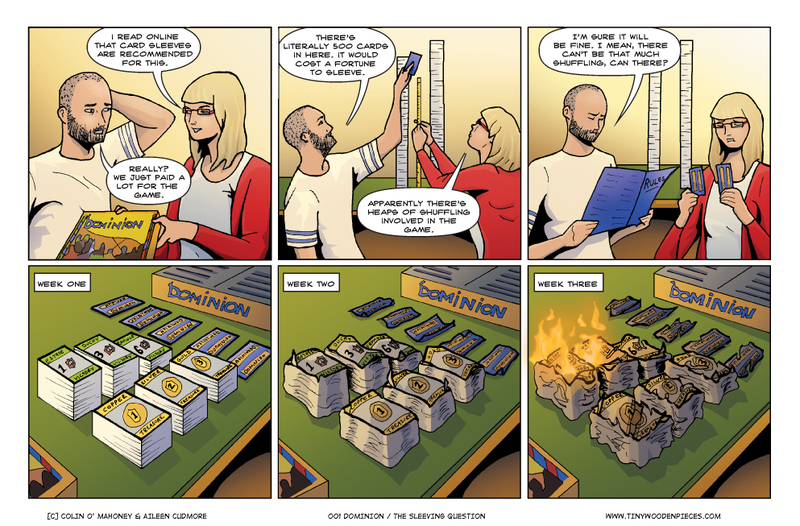 Welcome everybody to our very first comic on Tiny Wooden Pieces! We begin, not with an actual boardgame, but, rather controversially, a cardgame. Dominion doesn’t have any board, or even any dice, just lots and lots of cards… And it’s super fun. It’s so addictive, spending money to get more money, more cards, into your deck. And seeing it gradually expand always gives me an inordinate amount of pleasure. But as the deck gets bigger, it takes so much more time to shuffle. Which is why we ultimately decided to get sleeves. That, and protecting the cards from people with sticky fingers. The horror. The first few times I played, I just wanted to keep on building my deck. I could have happily carried on like that for hours, just trying out different action cards. But then someone goes and spoils it all and buys a Province. And so the real race begins. Time to see what your deck is really made of. I have to believe there is a market opportunity for cases that are in between penny sleeves and UltraPro protectors that cost 1/4 (or more) of the game price. Each new game I acquire I debate myself “will I play this game enough that the cards will deteriorate enough”. Dominion is definitely the most worn set and was not protected. Resident Evil (Deck Builder) that I spent the money and time to cover: not so heavily played. Enjoying the site, looking forward to it each week! Ah god, it kills me just how much sleeves and deck protectors can cost. Not to mention the time it takes to actually put them on the cards. For us, sleeving Dominion was definitely a two-person job, although by the end I was finding the process oddly therapeutic. Delighted you’re enjoying the site, thanks for the support!